The digital age of medicine is upon us. 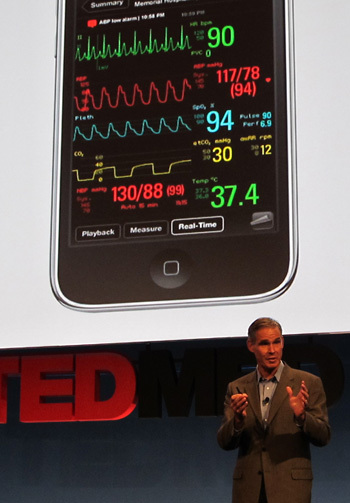 This past week at the opening Plenary session at the Annual Heart Rhythm Society Meetings, we heard Dr Eric Topol and others tell us that we must embrace social networking in order to engage patients and improve care. The Affordable Care Act has now changed the landscape of medical practice in the US–we must do more to focus on preventative care and work harder to curtail costs. More patients are insured and a primary care shortage is upon us (according to data from the AAFP). In fact, it is estimated that we must create an additional 65 training spots in primary care every year for the next 10 years in order to keep up with the demand–this is assuming that the AAFP estimate of a 25% growth in workforce will be needed to meet the growing pool of insured Americans. In addition, preventative services will require frequent follow up, patient engagement and support services. Patients are more connected than ever–most patients now go to the internet to prepare for office visits and come armed with lots of information. Office visits are already now dominated by keyboards and EMRs–it only seems logical that the next step will be virtual access for physicians and patients. With growing primary care shortages and an increasing pool of patients needed access to care, telemedicine is likely to play a much larger role in the future. The concept of telemedicine is not new–remote areas and hospitals have been utilizing telemedicine consults in order to provide specialist support for primary care physicians with limited access. This week, the Wall Street Journal’s Belinda Beck reported on the growing telemedicine business–doctors seeing patients via computer portals from nearly anywhere in the world. Several web based companies are now regularly hosting virtual doctor visits online where physicians and patients interact via phone and internet. Patients describe symptoms and discuss issues with their virtual doctor and are then prescribed therapy–all for a cost of only 40-50 dollars. Most visits are completed within 15 minutes and no travel is required for either doctor or patient. Advocates argue that for simple straightforward problems telemedicine visits are much more cost effective and also provide high quality efficient patient care. Critics have voiced concerns over the quality of care, lack of doctor-patient relationship and the over-prescription of antibiotics. Some argue that when a virtual visit occurs, diagnosis is made more difficult due to a lack of physical exam. 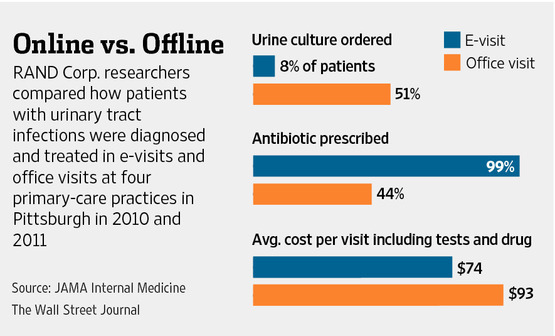 In addition, data obtained by the Wall Street Journal from Rand, indicate that virtual visits are more likely to result in the prescription of an antibiotic. As you may expect, guidelines from regulatory agencies and medical boards are currently in the works. Virtual physicians will be held to the same standards as in person office visits and continuity of care is being encouraged by allowing patients to choose their virtual doctor rather than have the provider randomly assigned. In addition, the Federation of State Medical Boards is now recommending that all virtual doctors are licensed in the state in which the patient that is treated resides. However, this particular requirement for licensing does not really make good sense if the objective of telemedicine is to provide care to those with limited access to physicians. Virtual medicine has the potential to meet significant primary care needs in remote, rural and underserved communities and may be an alternative to in person treatment of simple, straightforward medical problems. As we continue to reform the US healthcare system, many challenges must be met and overcome. Providing affordable, high quality, efficient care to a growing number of insured Americans is a significant task. With the advent of digital medicine and advancements in mobile technologies, it is now possible to provide care to patients who may otherwise remain unserved. Wearable sensors, mobile devices that can obtain real time electrocardiograms and other technologies in development make it possible to receive diagnostic data from remote locations. In order to be successful, we must embrace change and utilize the digital tools that are now available to provide care to those who so badly need it.